I’m not particularly the romantic type, or someone who fawns over relationships and weddings and the like, but the other week it was my friend Holly’s wedding and I was given an invite. I do like attending weddings as the buffet is usually amazing, and buffet is one of my favourite food groups. Holly had a hog roast, pick and mix and beautiful cupcakes, which my belly appreciated very much. As she lived with her new husband before the marital status they had a fancy pants ‘money well’ instead of asking for gifts, but I am ye of little funds, so I popped my DIY cap on and make them this bit of original T Lowe wedding inspired wall art instead. 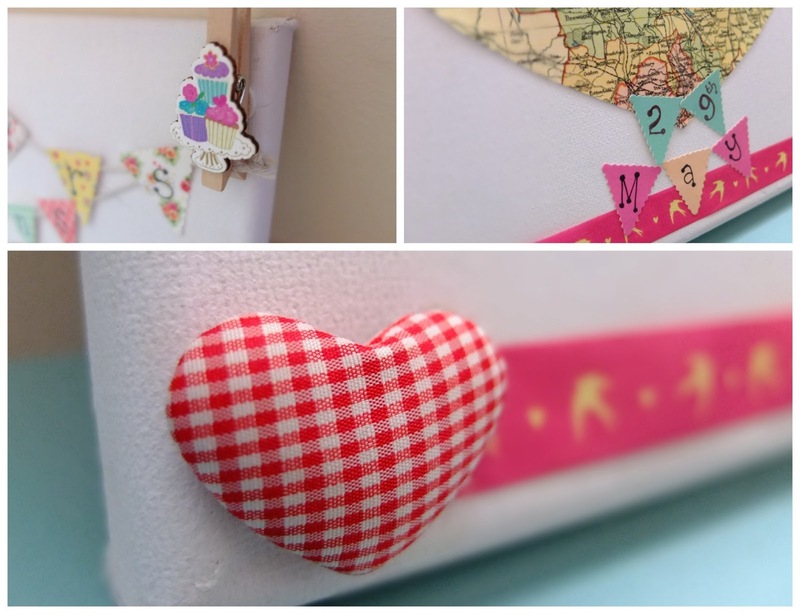 I got the idea from my previously blogged about DIY heart canvas. All the supplies were this were bought from The Range. I didn’t even know Stoke on Trent had a Range store until I first started chatting to Victoria (who is from Milton Keynes!) and she asked if I’d ever been! Goes to show how often I venture to the south side of the city huh. Anyway, The Range has an awesome array of craft and hobby supplies, I was pretty impressed and it definitely even gives Hobbycraft a run for it’s money. Some of the stuff is ridiculously cheap too (and some is ridiculously pricey) but it’s not hard to dig out the treasures if you know what you’re after. I know I wanted to make this twee and cute so there’s nothing like a bit of bunting to add that twee element to ANYTHING. 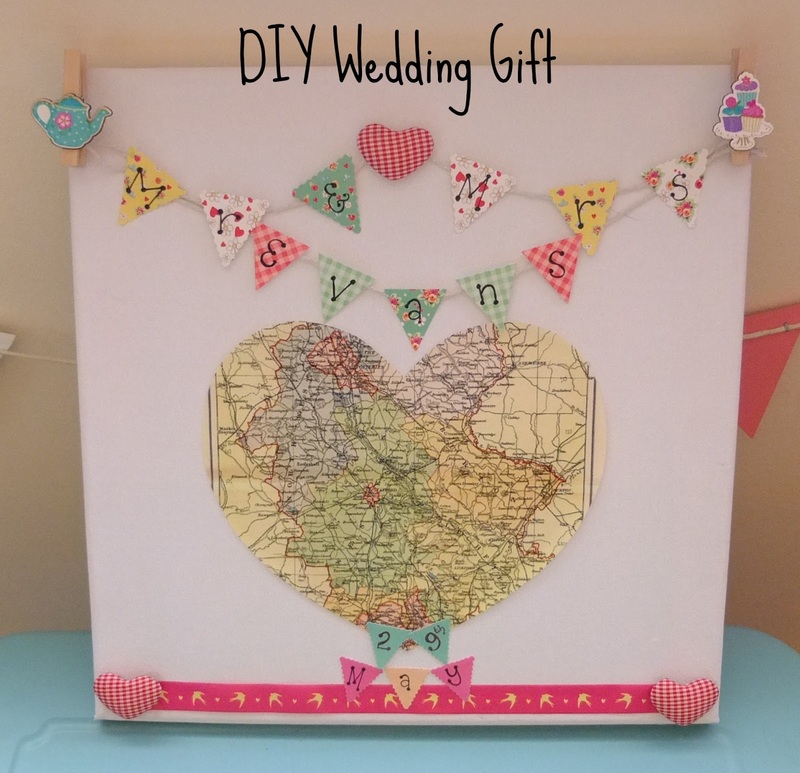 Altogether this cost around £5 to make, the little hearts and the pegs in the corners were a £1 each for a packet of 6, the bunting triangles were about £1.99 for a bag full and I also bought the canvas in a pack for 3 for £5. There were other little additions like the washi tape at the bottom and the string to hold the bunting too which I already had. The big heart in the middle is a print out of map of Stafford as that is where the happy couple met – their eyes met across a crowded retail park as one worked in the phone shop, the other in the coffee place. You know how it is. I thought this was a pretty good gift without being too soppy really, it’s cute and it’s also a memory of their relationship and day as I popped their new marital titles on and also the date of the wedding. It was my way to thank them for some awesome cupcakes and also a lavish pick and mix table. Yes I did take a mixture home to eat for my lunch the next day. Next Post I Am Spot-icus!